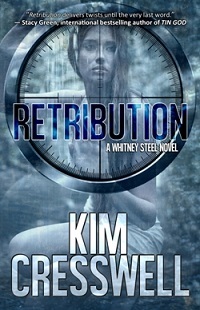 Whitney Steel is back in RETRIBUTION (A Whitney Steel Novel – Book 2)! Once the leader of the Sur del Calle cartel, Colombia’s largest drug trafficking organization, Pablo Sanchez patiently waits to exact his revenge against Blake Barnett, the FBI agent who killed his twin brother over a decade ago. From the neon paradise of Las Vegas to the militant-infected jungles of Bogota, Blake must risk his life and infiltrate the cartel’s inner world and eliminate the ruthless drug lord. The price of failure is higher than ever as he’s forced to use the woman he loves as a pawn in a deadly game–where the events of the past and present collide. **SPECIAL GIVEAWAY**: Kim is giving away an eBook of REFLECTION, A Whitney Steel Novel ~ Book One) to one lucky reader who comments on her Karen’s Killer Book Bench blog. Don’t miss the chance to read this book! Thanks, Kim, for sharing your story with us! How exciting. Just this excerpt has my attention! Good morning and thanks for sharing your newest book with us, Kim! I can’t wait to get to this story. What fun!